« [Setubal, Portugal] “Fantasma” não será esquecido. Um novo assassinato policial. 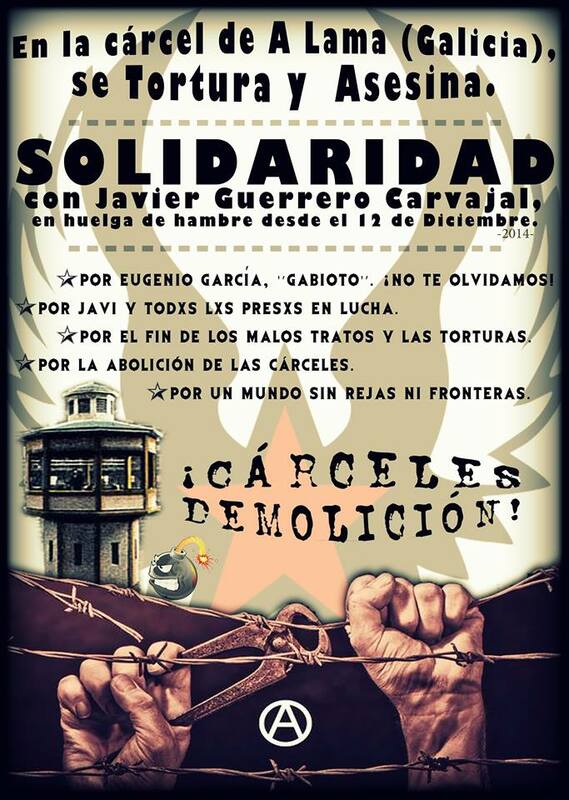 ¡Solidariedade con Javi Guerrero “Gaviota de Cádiz” aos 114 días da súa Folga de Fame! ¡NINGUÉN ESTÁ SÓ NAS MANS DO ESTADO! ¡ABAIXO A SOCIEDADE CARCERARIA, SEUS MUROS E SÚAS ILUSIÓNS! ¡SOLIDARIEDADE CON AS PERSOAS PRESAS! This entry was posted on Abril 7, 2015 at 10:25 am and is filed under galiza, opinión. You can follow any responses to this entry through the RSS 2.0 feed. You can leave a response, or trackback from your own site.